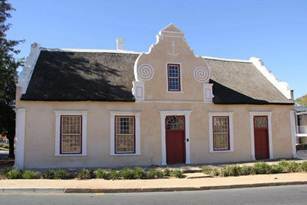 Len Raymond will discuss the restoration of the historic Loedolff House in Malmesbury, which is one of the oldest buildings in the town, dating back to the beginning of the 19th century. It had been much altered over the years so that its significance could scarcely be recognised. Len Raymond then bought the building and painstakingly removed some of the later alterations, restoring its thatch roof and gable. The restoration involved a careful reconstruction of the roof structure following the traditional, vernacular construction methodology of buildings of this date. The gable was reconstructed by Len Raymond, who had limited information regarding the appearance gables and this took painstaking research to decide upon an eventual design. He will discuss this research process in detail. Len Raymond is the current President of Heritage South Africa. He has also been actively involved in the Drakenstein Heritage Foundation and is regarded as an authority on the form and construction of early Cape Dutch architecture with an in-depth and hands-on knowledge of the detailing of these buildings. His company Dal Josaphat Restoration has undertaken the repair and restoration of numerous historic buildings at the Cape. Len is a passionate advocate for conservation and the role that local interest groups can and must play in the preservation of local heritage- an issue that he has taken seriously at provincial level. At the AGM held last month the membership fees for 2015 were ratified. It is impossible to correctly allocate payment of subs if your name is not indicated!! Also make sure that you have completed the membership form. We still have some paid-up members for whom we do not have any contact details. The 2015 membership coloured slips will be posted with the May newsletter.